Having a waterproof speaker is a must on these hot days. Lately it feels like we are in our pool more than we are not! Sure, we have other outdoor speakers, but having one to float right next to you in the pool is super fun! Product received for review. Post contains affiliate links. This waterproof speaker is powerful and can really crank the tunes. The music remains clear and static-free even at maximum volume. It’s easy to adjust the volume right from the speaker, so you don’t need to get out of the pool if it needs to be turned down. Getting the speaker set up is very easy. You do need a lot of batteries (6-10 AA’s) so I was glad that we happened to have that many on hand. The speaker takes 6 and the transmitter takes 4. There is an option of plugging the transmitter in which would eliminate the need of 4 batteries. After that you just plug in your iPod, stereo, CD/mp3 player, computer, or any other audio source using the standard connection included. The wireless transmitter will work up to 150 feet away. This worked out perfectly for us. 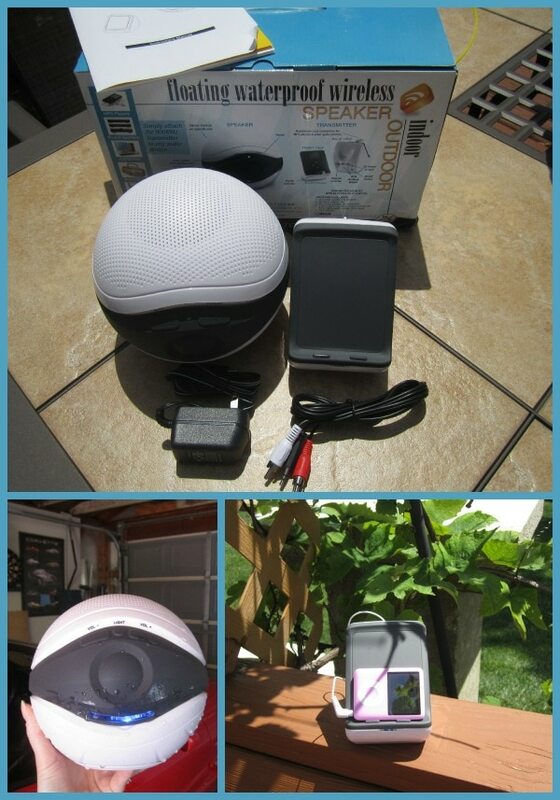 We can plug it into the garage outlet and then bring the speaker into the pool. The unit will scan for the best channel available, or you can manually scan the channels until you find the clearest. It will lock once the clearest is found. Having just the one speaker is more than enough for our pool, but if you do have a very large pool you can purchase additional speakers and they can all run off of the same transmitter. A blue mood light is a neat feature for night swims. Also, if your party is rockin’ and lots of splashing is going on, the music may become a little muffled. It’s easy to remove the top grate to dump out any water. The speaker goes right back to the clear, crisp tunes. We are enjoying our waterproof speaker and would recommend for summer fun! Bring it to the beach, pool, hot tub or anywhere to get the party started! Purchase your own speaker from HomeWetBar.com for $79.95. If I had a pool, I would be so all over these! That’s really cool – I’ve never seen or heard of that! Would be great for the beach too. This is RAD!!!!!!!!! I have to get one of these !! !